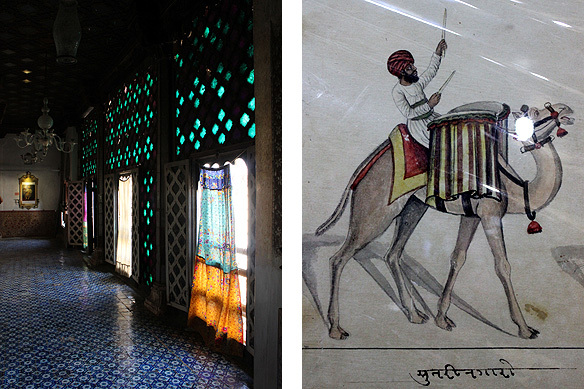 Think palaces and royalty in Kutch. Think Bhuj and Mandvi. They are (sorry, were) almost synonymous with each other till the 2001 Gujarat Earthquake which brought much of the region to dust. Yet a few structures still stand, recounting an era that whispers to the traveller. Kutch was a princely state till India’s independence; the walled city of Bhuj dating back to 1510 the state’s commercial and administrative nerve centre. 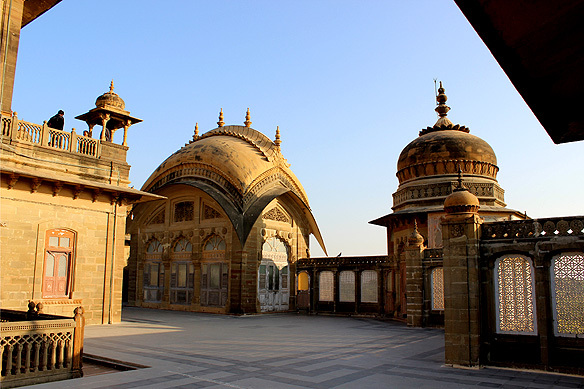 In 1548 Rao Shri Khengarji started work on the Darbargadh or palace complex. Over the next 300 years, subsequent rulers further added to it, reflecting prevailing cultural and artistic trends. It is my last day in Kutch. What better way to end my travels here than to explore this complex and see another side of the region, distinct from the salt pans and rough-hewn stories of the north. 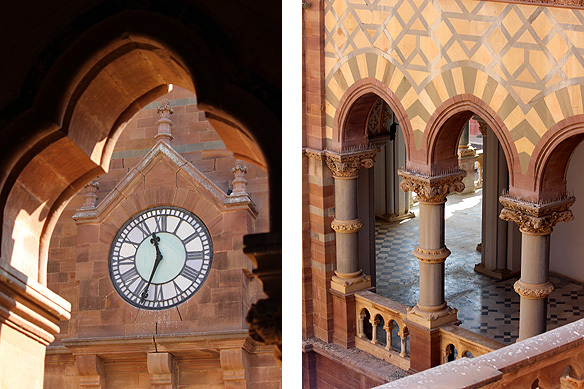 The poetic palaces of Bhuj and Mandvi, in stark contrast to the rest of Kutch, narrate a more genteel, lavish life—of pure indolent self-indulgence. 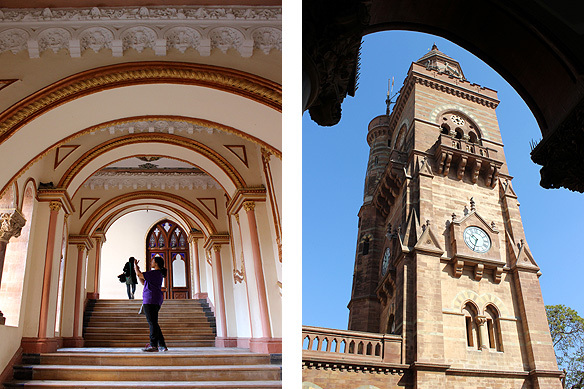 Prag Mahal is the personification of Kutch royalty as it was in 1879. Built by Rao Pragmalji II and designed by Colonel Wilkins, the palace is an Italian Gothic edifice built in marble and sandstone at the enormous cost of Rs. 3.1 million over a period of 14 years. The artisans working on the palace were paid in gold coins. Today, it is the embodiment of a time gone by never to return, with its rooms forlorn and forgotten, ghostlike in their desolation. The floors creak, the paint crumbles and the tapestry is worn and tattered. 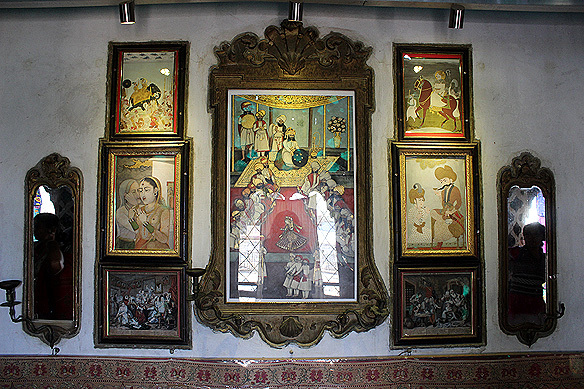 Raja Ravi Varma prints studded in real diamonds decorate one wall. 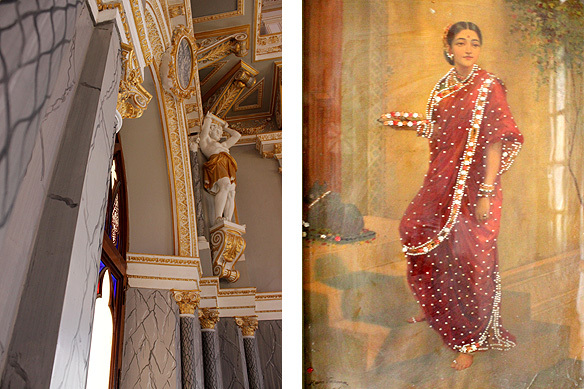 Classical statues and crystal chandeliers embellish the Durbar. Parts of the palace—including the 150 feet high Bing Bang Clock Tower—have been renovated following concerted efforts by Bollywood superstar, Amitabh Bachchan, Gujarat Tourism’s brand ambassador. The rest of the edifice sleeps itself to death around its bevy of tourists. Behind a rather shabby and nondescript façade next to the Prag Mahal is Bhuj’s most charming palace, the Aina Mahal built by Kutch’s local building community, the Mistris. 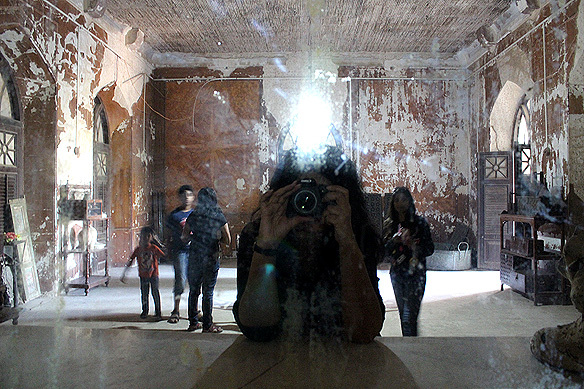 Dimly lit, its marble walls and ceilings are covered with mirrors of all shapes and sizes in golden ornate frames. 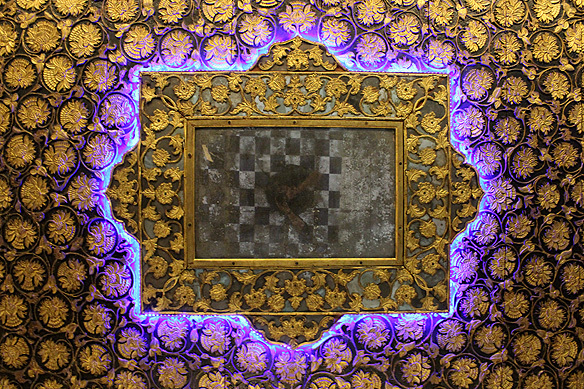 Separating the mirrors are ornaments embellished with gold lace and Venetian glass. The 18th Century palace is a magical world where I expect any moment to bump into Rao Lakhpatji, the Kutch king who built it in 1761. Though much of the palace was damaged in the 2001 earthquake, parts of it have been restored. 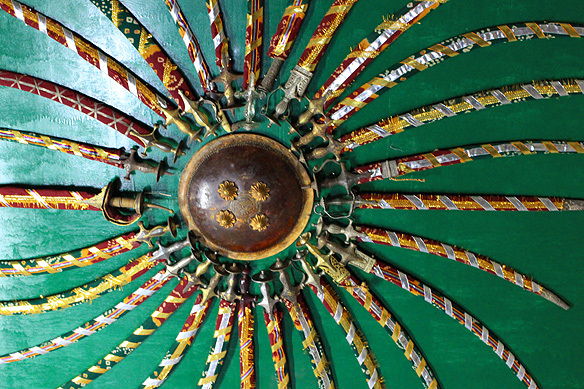 They comprise the bedroom, pleasure room, court room, and various arms and artworks, including a spectacular scroll of Kamangari art. And for the hour or so I am inside, I go back in time to when royalty was a fairy tale, at least in terms of their homes. My last stop is the once upon a time summer palace of the Jadeja Rajas of Kutch, the Vijaya Vilas Palace situated on the coast of Mandvi. It was built by Maharao Shri Khengarji III in 1929 as a summer palace for his son, Yuvraj Shri Vijayaraji, hence the name. 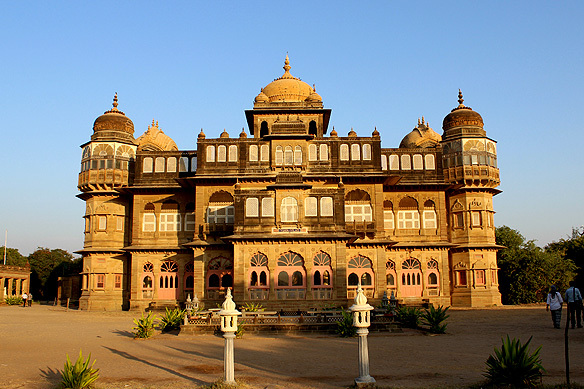 Partly museum and partly permanent residence of the royal family of the Princely State of Kutch, the red sandstone palace is built in the Rajasthan Rajput style. It is replete with domes, jalis, jharokas, chhatris, chhajas, murals, coloured glass works, and is the site for many a Bollywood film, most famously Hum Dil de Chuke Sanam. 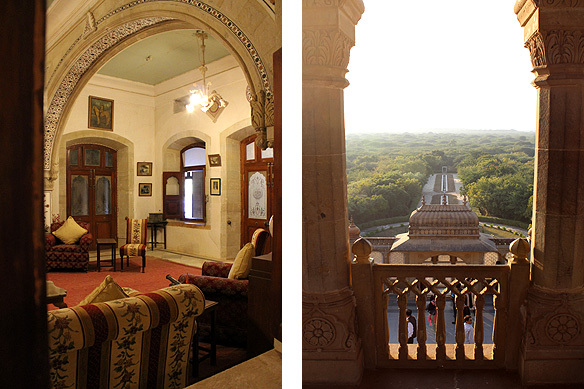 Three palaces from Kutch’s royal heritage. One dying, one resuscitating, and one still infused with life. All magnificent ensembles of art and architecture. Enjoy it, dear fellow traveller, while it remains. This entry was posted in Exploring India, Gujarat and tagged 2001 Gujarat Earthquake, Aina Mahal, Amitabh Bachchan, Bhuj, Bing Bang Clock Tower, Darbargadh, Gujarat, Gujarat Tourism, Jadeja Rajas of Kutch, Kamangari Paintings, Kutch, Mandvi, Palaces, Prag Mahal, Princely State of Kutch, Rao Lakhpatji, Vijaya Vilas Palace by Rama Arya. Bookmark the permalink.